Season one of the audio drama We’re Alive is done, making it the perfect time to review it as a whole. 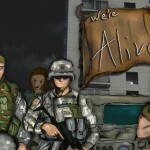 As one of the few episodic audio dramas around and perhaps the only ongoing such series that tells the tale of a zombie apocalypse, We’re Alive is well-positioned to make waves in the zombie world. The story follows a relatively familiar zombie apocalypse plot arc. We start with a small group of soldiers, called to report to duty to deal with some sudden and extreme “rioting.” The rioters turn out to be flesh-eating freaks that turn their victims into more of the same. The soldiers flee, find other survivors and hole up in an abandoned apartment building. As in so many stories of the type, the narrative follows the group as they fortify their tower, look for supplies and survivors, encounter other groups of survivors and face the zombies. The basic story elements are familiar. What sets We’re Alive apart is the twists. This is not a Dawn of the Dead clone set in a tower instead of a mall. It has its own unique personality, based in its original take on the zombies themselves, its distinctive cast of characters and its unusual format. The episodic audio drama format allows the story to stretch out in a way that only Robert Kirkman’s Walking Dead has really managed before. Each of its twelve episodes is roughly an hour long, allowing ample time for the characters to express themselves and grow, for the situation to evolve at a natural pace and to really explore the experience of survival in a post-apocalyptic, zombie-infested wasteland. The production utilizes a strong mix of music, sound effects and dialog to tell its story in an audio-only format. The story itself is framed as coming from journals kept from the survivors, but the use of voiceover narration implied by such a framing device is wisely utilized to a minimal degree. That keeps the action at the forefront and helps foment the natural tension inherent in many of the situations. There are certain limitations enforced by the format, especially in action-heavy sequences, but the producers typically do a fine job of keeping the listener immersed and keeping the action straight, given the constraints they are working with. Would it work better as a TV show? Perhaps, but it isn’t fair to criticize it for not being something else. It’s like complaining that a horse isn’t a car — it simply is what it is, and it works well within the boundaries of its existence. The characters are all well-realized and distinctive, which can be difficult given you can’t see any of them. Early on, it can be a little tricky to keep them straight, but once you’ve spent a little time with them, their personalities become distinct. As in any ensemble drama, some are better than others — or at least, different people will take away different favorites. For me, the standouts are Burt, a grizzled Marine vet, and Saul, a wisecracking soldier that was one of the initial cadre. Like all great zombie dramas, it’s wise not to get too attached to any character — it takes a while, but eventually some of them suffer a cruel fate. The actors that bring the series to life are all solid. Again, some are better than others and there are some occasional rough spots. That said, there are more highlights than ugly missteps. More importantly, none of the rough spots are enough to derail the story. Overall, the cast is at least as good as 90 percent of what you’d find in a typical B-movie zombie epic. The zombie themselves are one of the show’s strengths. Unfortunately, it’s impossible to talk about what makes them unique without seriously spoiling some of the best parts of the series. Put simply, the discovery of what the zombies are and how they work is one of the most appealing elements of the series, much like the slow revelation of the Island’s mysteries on Lost. To tell you, “Here’s what is cool about them,” would be to ruin the fun, so you’ll have to take my word that the zombies here are worth discovering, unless you are a stickler for straightforward Romero zombies only. Overall, it’s a great series with a strong indie vibe and some rough edges. In its favor, a lot of those are smoothed out as it progresses. The first season ends on a cliffhanger, and it’s no exaggeration to say that I am awaiting its return with a fair bit of excitement. its format allows you to listen while you commute, exercise or take a cross-country roadtrip, meaning that its twelve-hour commitment is easy to embrace and most will find the payoff well worth it. There’s nothing quite like it out there and I recommend it as one of the best independent zombie creations in existence. For more info, read my story on the producers of We’re Alive. 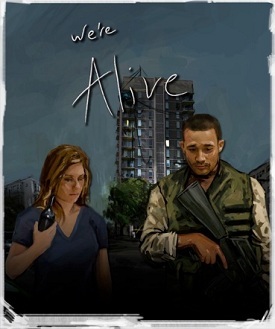 Find the series itself online in the iTunes store (keyword We’re Alive), on Facebook or at the official website. As the L.A. Zombie Examiner for Examiner.com, I got the lucky chance to write up a story about the podcast as well. Your review, however, rocks the socks of my lowly article ;-) Anyway, this show indeed is amazing, and I’m glad it’s getting the acclaim it deserves. To see it as a TV series would be awesome, but as it stands, it’s a great format to keep running in the background on your MP3 player or computer while you’re doing other stuff. Love it!